Enhance the ambiance of any home or restaurant setting with this modern style bistro table from HomCom. The sleek and clean design is made for tight urban spaces both indoor and outdoor. Perfect for that contemporary kitchen or bar area to maximize space. Cozy enough to use at home but solid enough for a business or industrial setting, our HomCom bistro table is versatile in any environment. 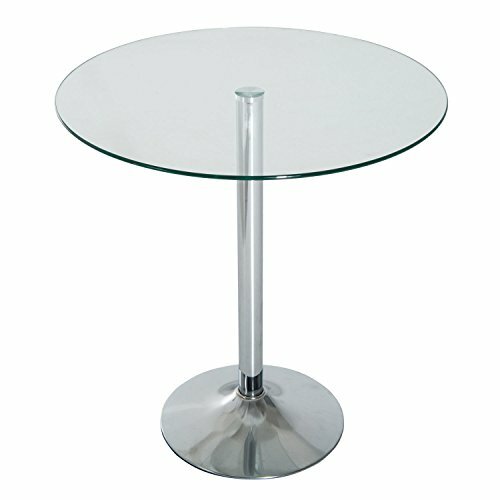 - Durable glass top with extra stable chrome leg and base for maximum support. - Bottom Base Dia: ✔15"
✔ STYLISH LOOK: Modern, contemporary style looks stunning and adds to any home, business, or restaurant experience. ✔ DURABLE DESIGN: Durable glass top with extra stable chrome leg and base for maximum support. ✔ COMPACT SIZE: The sleek and clean design is made to fit tight areas allowing you to maximize space. ✔ WEATHER-RESISTANT: Weather-resistant construction makes it suitable for both indoor dining and outdoor patio use. ✔ LIGHTWEIGHT BUILT: Lightweight and portable so that you or your customers can easily move it from location to location.